It’s been more than two years since I shared our household philosophy here, so I think it’s time to do so again. It has hung in the front entry way of all three of the houses Terry and I have shared. It comes from the long biographical essay “About Ed Ricketts” in the back of John Steinbeck’s book, The Log from the Sea of Cortez. Steinbeck and Ricketts were close friends and Steinbeck wrote the piece after Ed’s untimely death. Ricketts was known for enjoying time with the ladies, and also for not taking responsibility for the consequences. Steinbeck writes that Ricketts, a scientist, came up with this logical, structured formula after three youngsters, for whose origins he apparently shared responsibility, were deposited on his front doorstep. 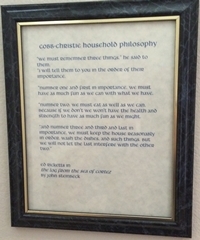 Terry and I have long felt that Ricketts’ formula reflects what we consider to be important in our daily lives. “We must remember three things,” he said to them, “I will tell them to you in the order of their importance. “Number one and first in importance, we must have as much fun as we can with what we have. “Number two, we must eat as well as we can, because if we don’t we won’t have the health and strength to have as much fun as we might. This is every bit as true for us today as it was when we first hung it on our wall in Mountain View in the mid-1990s. Did you see my post awhile back that my former boss has bought the boat on which Steinbeck wrote “The Log from the Sea of Cortez”? He’s currently refurbishing it to be returned to Monterey. I did see that. Very cool!